Use in place of ERS-105 Busway Hanger Set, where mounting bolts are to fasten vertically to supports. Takes 3/8" diameter bolts. Can be attached to busway (track) at any point between busway joints. Minimum of two busway hangers required for each straight busway section. Used in place of track hanger FRS-105 where head room is limited. Takes 3/8" diameter bolts. Can be attached to straight track at any point between track joints. Not suitable for curved track. Item: Hanger (low level). 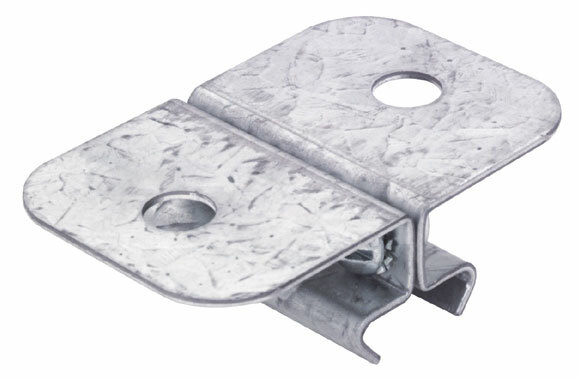 Note: Minimum of two track hangers required for each straight track section.. For: FRS100 & FRS200 Series (Feedrail®) Track.. For: FRS300 Series (Plug-In Service).